It doesn’t take much longer to cook a piece of meat that’s twice the size you need for dinner, and it’s a time-wise investment when the objective is an easy meal later in the week. Start with an economical pork shoulder roast. Marinate it for a half-hour or up to a day ahead. Then, when the meat is cooking, basically untended, you have time to prepare the rest of the meal, perhaps roasted or steamed little Yukon Gold potatoes and asparagus, and a watercress salad. Mu shu rolls. 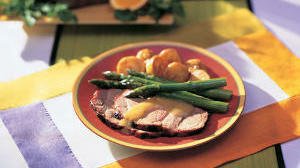 Use cooked poultry, pork, beef, or lamb. Thinly slice the meat and warm in a microwave oven just until steaming. Lay meat on warm flour tortillas and add to taste shredded cabbage, Asian plum sauce, and sliced green onions. Roll tortillas around fillings and eat out of hand. Pasta with peanut sauce. Moisten bite-size pieces of cooked poultry, pork, beef, or lamb with purchased Asian-style peanut sauce and season to taste with seasoned rice vinegar, minced fresh cilantro, and green onions. Mix with hot cooked, drained pasta such as fettuccine or bow ties. Hot chutney salad. Thinly slice cooked poultry, pork, beef, or lamb and mound portions onto the cupped side of pocket bread. Sprinkle with shredded jack cheese and heat in a microwave oven until cheese melts. Top with mango chutney and sliced avocados. Risotto. Prepare risotto (from a mix or recipe). When rice is just cooked, add thin slivers of cooked poultry, pork, beef, or lamb and mix. Sprinkle shredded parmesan or fontina cheese on portions.